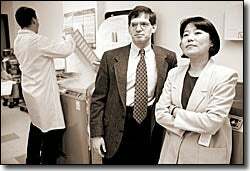 Left to right, Chris Webb, a Research Assistant with Physicians Health Study, stores plasma samples along with Ed Giovannucci and Jing Ma. binding protein-3 (IGFBP-3) produced the opposite effect. times the risk of prostate cancer than those with the lowest levels. mass and decrease in fat. features, hands, and feet due to excess secretion of growth hormone. higher that those of normal people,” she notes. basis of our results,” Ma cautions. confirmed by additional large studies. activity of IGF-1 and IGFBP-3. lifestyle changes that are not too drastic,” Ma speculates. of the growth factor and its binding protein,” notes Giovannucci.